BLU-U Blue Photodynamic Therapy is a non-drug therapy for moderate acne. It's a unique blue light that kills the P. acnes bacteria in your skin. BLU-U light treatments are gentle and typically well tolerated by patients. The BLU-U light alone is FDA cleared for light alone treatment of moderate inflammatory acne. 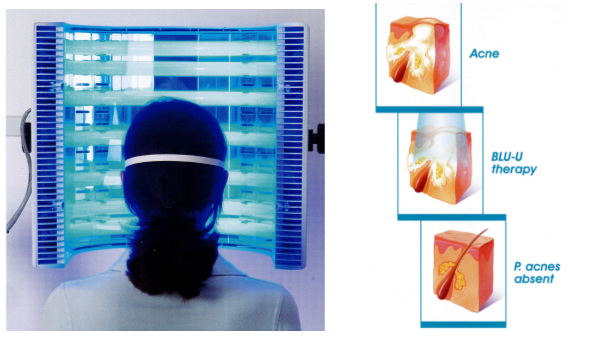 Levulan® Kerastick® (aminolevulinic acid HCl) for Topical Solution, 20% (LEVULAN KERASTICK) plus blue light illumination using the BLU-U® Blue Light Photodynamic Therapy Illuminator (LEVULAN KERASTICK and BLU-U PDT) is indicated for the treatment of minimally to moderately thick actinic keratosis of the face or scalp. Actinic keratosis (AK) are rough-textured, dry, scaly patches on the skin that can lead to skin cancer. It is important to treat AK because there is no way to tell when or which lesions will progress to squamous cell carcinoma (SCC), the second most common form of skin cancer. So, now is the time to manage your damage! LEVULAN KERASTICK and BLU-U PDT, a 2-part treatment, is unique because it uses a light activated drug therapy to destroy AK. How does it work? LEVULAN KERASTICK Topical Solution is applied to the AK. The solution is then absorbed by the AK cells where it is converted to a chemical that makes the cells extremely sensitive to light. When the AK cells are exposed to the BLU-U Blue Light Illuminator, a reaction occurs, which destroys the AK cells. *Patients treated with LEVULAN KERASTICK and BLU-U PDT should avoid exposure of the photosensitized lesions to sunlight or prolonged or intense light for at least 40 hours.